A close relationship exists between language and music in Ghana (as in most of Africa). Instruments can convey specific messages by imitating the patterns of pitch change in the words of African languages. These patterns, almost unknown in European languages, are actually short melodic phrases comprised of two or three adjacent tones of a diatonic scale. Since the patterns are constant for each word, musicians are able to "talk" with their instruments by reproducing the pitches alone. 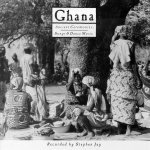 This album was recorded in the Brong-Ahafo, Eastern, Western, and Upper Regions of Ghana and reflects the rich diversity of traditional musical forms alive in Ghana today.